THIRUVANANTHAPURAM: Brisk sales were witnessed at the Poorada Chantha organised on the central prison premises on Monday as all the pesticide-free vegetables were sold out within two hours of the fair. Vegetables grown by prisoners on various prison premises in the district were sold at the fair organised as part of Onam. A total of Rs 80,000 was collected from the sales. 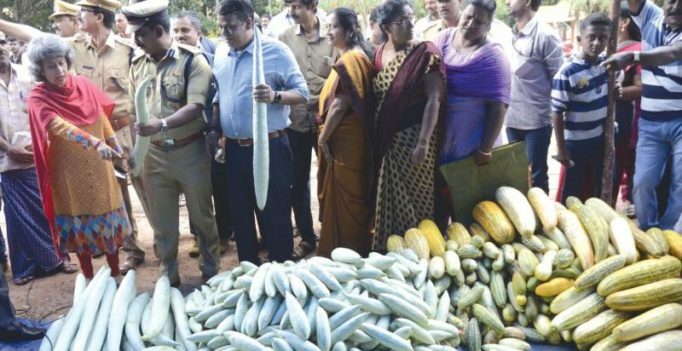 “The response was overwhelming, with even people from distant places queuing up to buy pesticide-free vegetables,” said DIG (prisons-south-zone) B. Pradeep. Though the fair was planned to be held from 10 am to 1 pm., all the vegetables, as well as bakery items, were sold out within two hours. State police chief Loknath Behera inaugurated the fair. Though Poorada Chantha is organised every year, bakery items and handicrafts were sold for the first time. As many as 30 varieties of vegetables and tuber crops were put on sale. The highlight of the produce was that they were grown without harmful pesticides being used. Half a dozen varieties of snacks, including traditional items like ‘ari unda’ (rice ball) and different kinds of pickles, all made by inmates of women’s prisons, were sold like hotcakes. Various handicrafts made by prison inmates were also sold at the fair.